Product packaging has always been the realm of marketing departments. But purely design-driven packaging decisions often inflate costs further downstream in the supply chain. 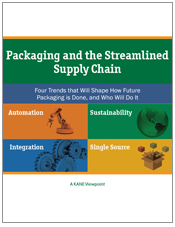 Logistics professionals who seek broader supply chain leadership roles need to understand four important packaging trends that have prompted consumer goods manufacturers to rethink how they manage contract packaging – and what partners are best suited to handle this important function. This paper explains these packaging trends and their implications.